Suspicions are growing in the local underground party scene that there is an undercover operative amongst them who has penetrated the elusive center of the local drug economy. Word of the "next level undercover program" emerged when party goers began to suspect a newcomer DJ to the local scene. 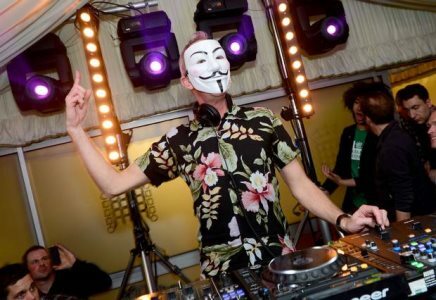 Evan Nowes, a local raver, made claims that according to documents stolen from the SPVM's intranet, new initiatives were being created to more effectively monitor the local party scene from within by creating the ultimate undercover operative. The documents go on to detail the ongoing efforts and programs police have been deploying to further enter the scene undetected, gaining trust and respect from local party-goers using existing intelligence gathered over the last few years. According to one stolen document, police have chosen only the most physically and socially convincing individuals to train for this program with one to be selected for the 2 year operation. These initiatives required participants to study the culture using available resources which included entries with titles such as "Fashion and Culture Assimilation for Better Target Emulation", "Beat Matching and Sonic Endurance Training for Enhanced Musical Empathy" as well as "Understanding Nightlife Colloquialisms and Other Social Mechanisms". This discovery has sent a chill down the spines of local party goers but the group that has shown the most concern have been the local drug dealers. This has led to Cold War levels of paranoia to reverberate through the community and has created tensions that are beginning to lead to false accusations and altercations. The undercover has not yet been discovered and this has led to some dealers reportedly ceasing sales until further notice. Others have chosen to continue to take the risk while ensuring they completely isolate anyone suspected of being an undercover from the ongoing drug activity that plagues the local scene. Alex Beron was one of several new ravers to be targeted and accused by party going peers. "At one point, the rumor that I was the undercover spread so far that people would move away when I would approach them at parties. It felt like I had a disease. No one would talk to me or sell me even a piece of weed. I've been having a terrible time, I just want to get high and listen to some psy." The SPVM would not comment on the stolen documents but dismissed that such a program is currently in operation. Despite this information, ravers have not taken any comfort in the statement and have continued to cautiously go about their activities with increasingly active vigilance.